Review: Essence Lipsticks - Cherry Colors - Cosmetics Heaven! I passed my exam, yay! That means more blog posts and that it's time to look for a new job! I'm sorry that I didn't post much for the last two days or so, but I was really stressed out. I have one lipstick from Manhattan (it's creamy, but it's almost the exact color of my lips! 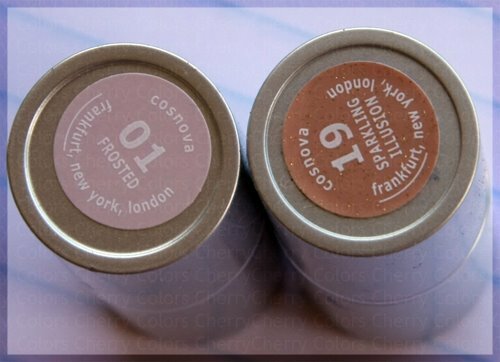 Didn't know when I was buying it, I was trying to get a matching color for my skin tone), and these two from Essence. If I'm not mistaken they're priced a little above 1€ (but max 3€), which is really cheap for a good lipstick! I have them in color 01 which is a cold pink and 19 which is a really shimmery brown. I don't wear lipsticks much because I love lip balsams of all the stuff I put on my lips. But they're a nice upgrade for a normal or night look. Excuse the terrible look of part of the lipsticks, but if I take any lipstick too much out, I tend to break them (all!). These did not break (yet), but I had to hit them on the cup. I know, I'm clumsy, that's one of the reasons I don't wear lipsticks, too! When it comes to coverage I think they're somewhere in the middle, the frosted one is quite pigmented, but the brown one is much or less a tiny bit of brown with lots of shimmers. The shimmer isn't annoying because it's not really big, but I don't like the fact that when the lipstick wears off, the shimmer stays on the lips! They are really creamy, have added E vitamin to them so they feel nice on the lips too. The Frosted is a really light cold pink, which looks really nice alone, but I prefer to combine it with other lipsticks and lip gloss, because I don't have pure white teeth but they have a tiny bit of yellow in them (I guess those are genes), and with such a cold color it's really noticeable. *The price, they are really affordable. *The consistency, they feel great on the lips! *The look, they are super cute! *The smell, they smell like candy! *They are not really resistant. They would stay on your lips for about three hours and then you'd have to touch them up. I guess they can be compared to some lip glosses. I guess they're ok for someone who would like to try a lipstick for the first time, but doesn't want to spend much on them anyway, plus for a starter, it may be a plus that some colors aren't really that opaque.